The City of Monterey is located on Monterey Bay along the Pacific coast in Central California. Monterey lies at an elevation of 26 feet above sea level. Monterey is situated approximately 115 miles south of San Francisco and 350 miles north of Los Angeles. Monterey Bay lies to the north, the Pacific Ocean to the west, and Carmel Bay to the south. The latest census states the city population to be approximately 30,641, with 12,600 households, and 6,476 families residing in the city. Geographically Monterey city has a total area of 11.7 square miles, of which 8.4 square miles is land, and 3.3 square miles or 28.05% is water. The city is situated on the Monterey Bay National Marine Sanctuary, a federally protected ocean area extending 276 miles along the coast. The zip code for Monterey is 93940 and the telephone area code is 831. Few places on earth can live up to their own mythology, but Monterey is a notable exception. No matter what you’ve heard or seen in feature films, nothing can prepare you for the jaw dropping beauty along Monterey’s fabled coast and village-like pedestrian thoroughfares. John Steinbeck was a frequent visitor, and drew considerable inspiration from area landmarks including Cannery Row, which he helped to immortalize in his novel of the same name. Today, restaurants, boutiques and attractions like the Monterey Bay Aquarium have helped make Monterey a favorite destination for visitors from around the world. Monterey’s historic character, natural beauty, and unique attractions have enabled it to become a quality residential community. Monterey also prides itself on being a clean and safe place to live and visit. Part of the attraction is the sense of community and the vibrant village spirit which is reflected in the numerous activities and events held in Monterey on an ongoing basis. Monterey’s residents are culturally diverse, each with unique skills. Monterey’s recent designation as a “language capital of the world” reflects the diversity and language skills of its residents. The climate of Monterey is regulated by its proximity to the Pacific Ocean, culminating in a Mediterranean like climate. As a result, Monterey’s average high temperature ranges from around 60° Fahrenheit in winter to 72° during the summer months. Average annual precipitation is around 19.5 inches, with most rainfall occurring during California’s wet season between November and April. Monterey city is noted for its rich history of resident artists beginning in the late 1800s, and its historically famed fishery. That changed in the 1950s, when the local fishery business collapsed due to overfishing. A few of the old fishermen’s cabins from the early twentieth century have been preserved as they originally stood along Cannery Row. Many California “firsts” occurred in Monterey. These include California’s first theatre, brick house, publicly funded school, public building, public library, and printing press, which printed The Californian, the first newspaper. Monterey has a strong arts community. Museums and entertainment venues abound in the city as do local and internationally known artists. Monterey is also the home of the Monterey Museum of Art. The Thomas Kinkade National Archive was founded in 1994 and is located within the Harry A. Greene Mansion at 361 Lighthouse Avenue. Monterey is also the site of numerous waterfront arts and crafts festivals held in the Custom House Plaza at the top of Fisherman’s Wharf. There are several institutions of higher education in the area, including California State University, Monterey Bay at the site of the former Fort Ord; the Defense Language Institute, located on the Presidio of Monterey, California; the Naval Postgraduate School, on the site of a former resort hotel; the Monterey College of Law; the Monterey Institute of International Studies; and Monterey Peninsula College, part of the California Community Colleges system. Monterey is steeped in history and famed for the abundance and diversity of its marine life, which includes sea lions, sea otters, harbor seals, bat rays, kelp, pelicans and dolphins. Sealife makes Monterey a popular destination for scuba divers of all abilities ranging from novice to expert. The Monterey Bay Aquarium, one of the largest in North America, hosts several important marine science laboratories. Monterey’s geographic location gives scientists access to the deep sea within hours, and only a few miles offshore is Monterey Canyon, the largest and deepest underwater canyon off the Pacific coast of North America. The Monterey Bay Aquarium has been acclaimed as one of the finest in the world, while also becoming a leader in ocean conservation. The popular aquarium sparked a tourism boom for the Monterey Peninsula when it opened in 1984, and has attracted approximately 2 million visitors every year since. There are five times as many hotel rooms on the peninsula now as there were in 1984, and tourist spending has tripled to about $2 billion a year. However, few people know that the aquarium was originally conceived by four diving buddies while drinking margaritas after a day in Monterey Bay. One of them was a daughter of computer giant David Packard. When she told her father the idea of converting a former sardine cannery into an aquarium to display the marine life of Monterey Bay, he liked it so much he decided to pay for the construction. The “My Museum” known as the Monterey county youth museum is especially popular with small children, and is located within walking distance of the present day Fisherman’s Wharf, and directly adjacent to The Museum of Maritime History. 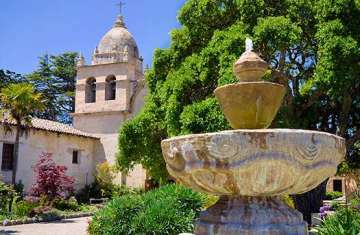 Monterey also has much to offer anyone who wants to dip into California’s history including several museums, and more than thirty carefully preserved historic buildings. What may be the only whalebone sidewalk still in existence in the United States lies in front of the Old Whaling Station. Lake El Estero is a popular Monterey Park featuring recreation opportunities including paddle boats, the Dennis the Menace Park, and a skate park designed by local skaters. Birders are especially fond of this park due to its easy accessibility and the diversity of bird life it attracts. The median price of a home sold in Monterey for the first six month of 2010 has been $321,703 the cost per sqft $173 and average days on the market has been 84 days. The highest sale was $3,250,000 Million for a 7000 sqft home that sold on Sundance Lane. The lowest sale was $40,000 for a 2 bedroom one bath home that sold on Annette Street. Purchasing a main residence or vacation home in Monterey is a community where the knowledge and expertise of real estate broker Nicole Truszkowski is vital before embarking upon a purchase of Monterey homes for sale. You will appreciate the guidance and knowledge of Nicole to help you decipher the sixteen unique neighborhoods within the City of Monterey and how they will accommodate you real estate desires. When searching for real estate in Monterey, you will find that it is divided into sixteen subdivisions or sub communities. Each subdivision has its explicit advantages and unique characteristics which create a real estate value specific to that location. There can be dramatic variance in pricing of homes with similar square footage and lot size based on the subdivision where the home is located. The map tab above provides a detailed Google map for each sub community; each sub community is identified with a number and name that matches realtor search codes. Scroll over each area of the map for a brief description and link to listings specific to that sub community. The map will open up to the street level for detailed viewing.